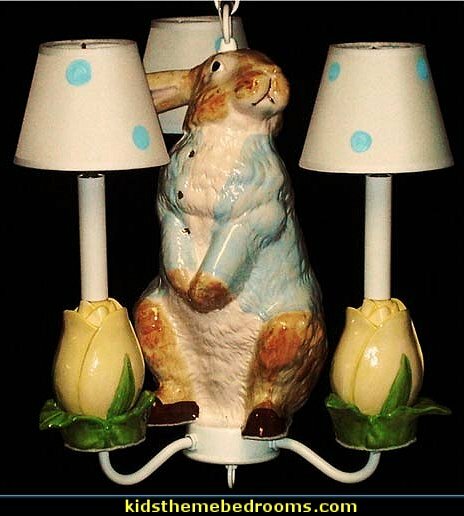 This adorable hand painted Peter Rabbit chandelier features a vintage inspired bunny with a blue jacket and brown slippers surrounded by yellow tulips. 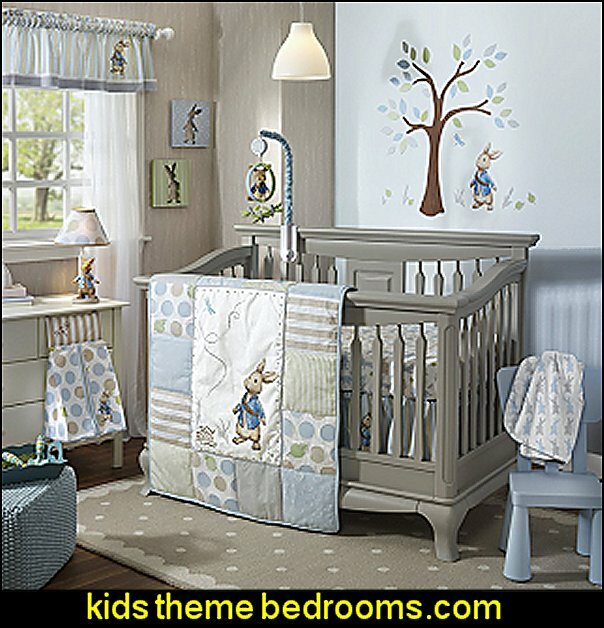 The shades feature light blue polka dots to put the whole look together. 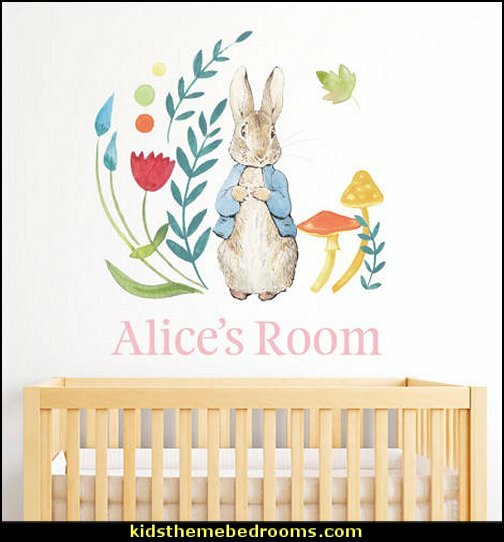 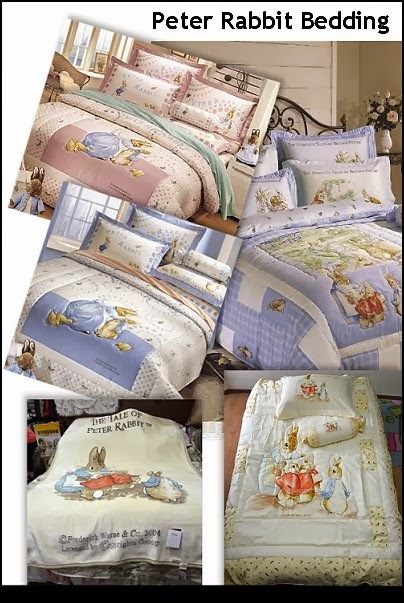 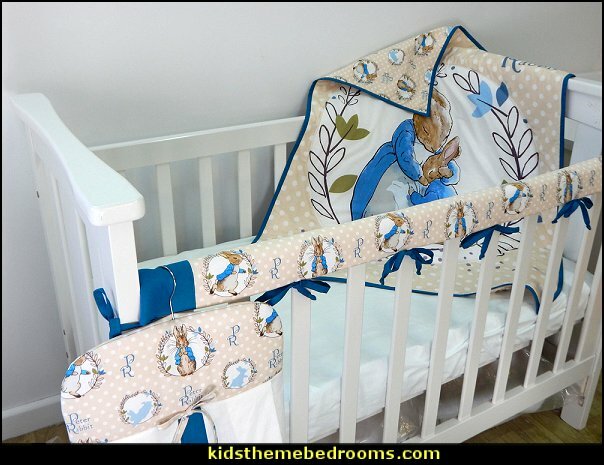 Perfect for any nursery with a Peter Rabbit or vintage bunnies theme. 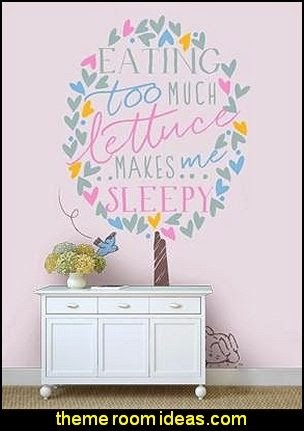 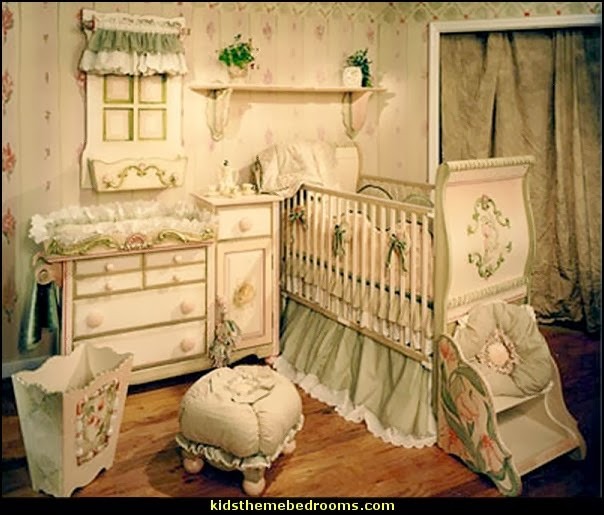 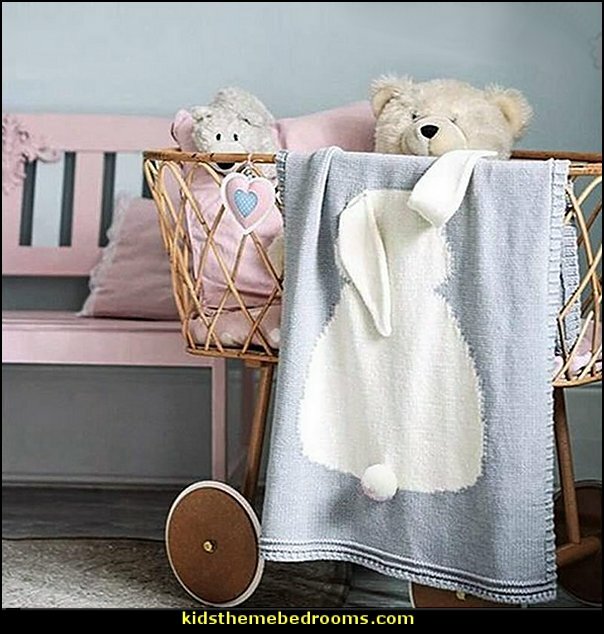 The Perfect Addition to Your Nursery! 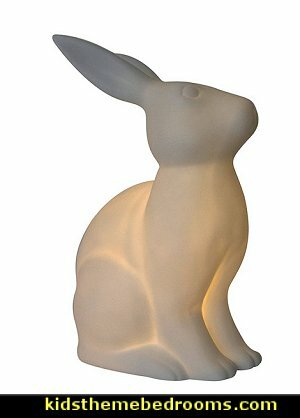 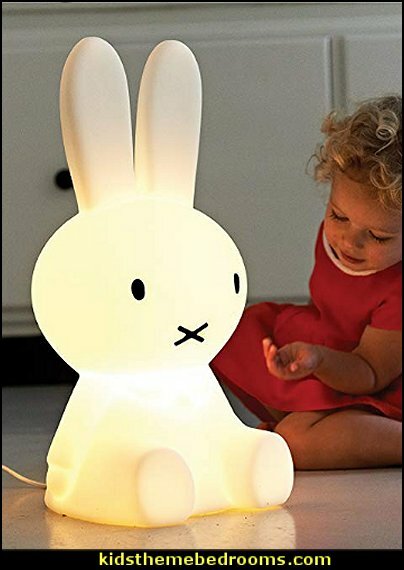 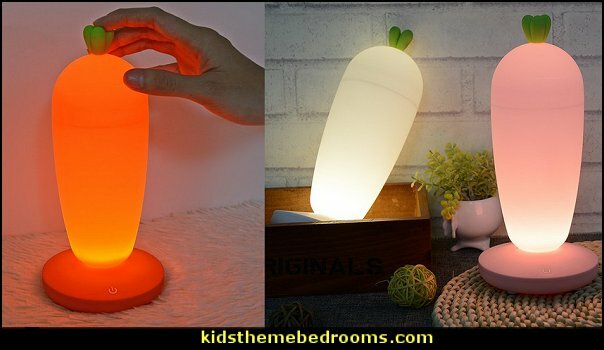 Whether your little ones nursery is themed with Peter Rabbit motif, vintage bunnies or you're looking for that special piece to put the finishing touches on the room, this table lamp is just the thing. 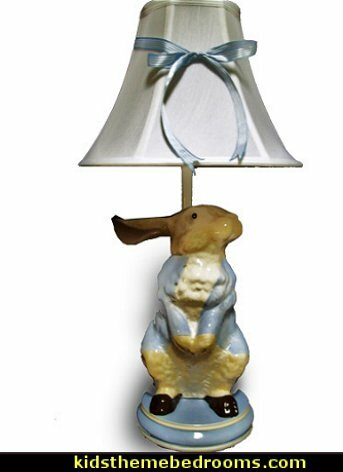 The hand painted base, white shade and charming ribbon make this lamp a real treasured keep sake. 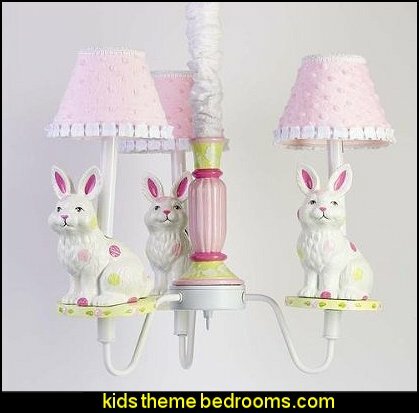 The adorable leaping bunnies perched on our Bunny's Carrot Garden 3 Arm Chandelier, will add a whimsical look to your little one's room. 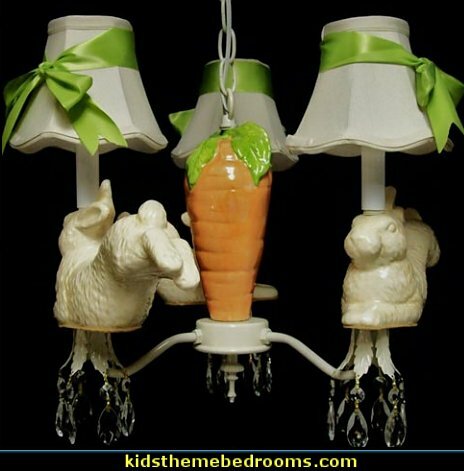 With a carrot for bunny in the chandelier center and white silk shades tied with a green bow for the finishing touch, this chandelier will bring sunshine to the room. 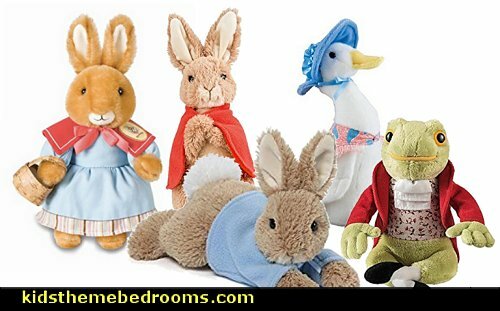 Peter Rabbit is another Beatrix Potter character and he stands at 38cm or 15 inches tall. 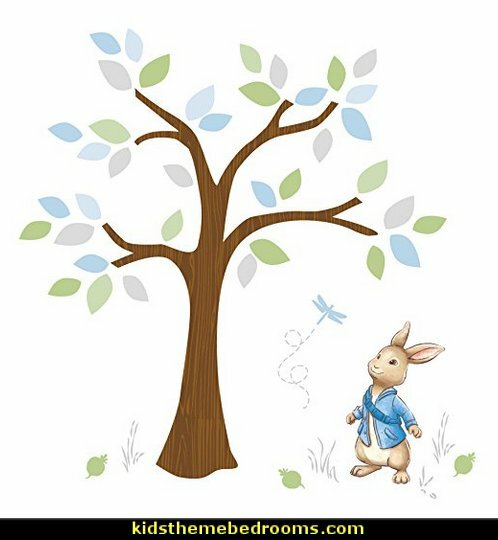 He is very colourful in his pretty blue jacket. 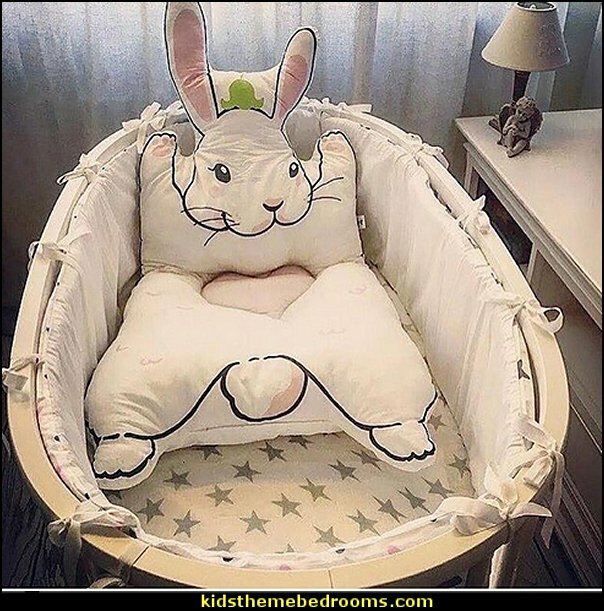 He would make an amazing gift for any occasion. 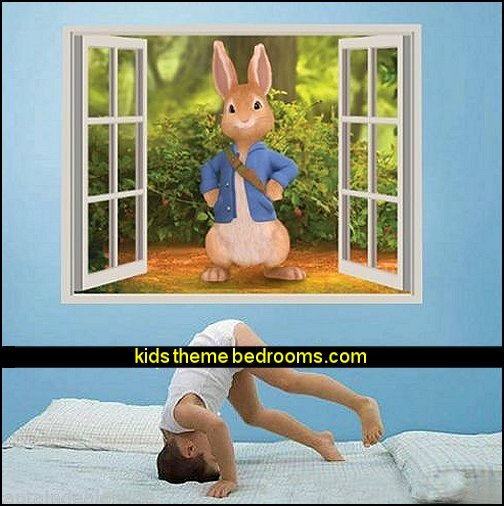 Perfect for children and those young at heart . 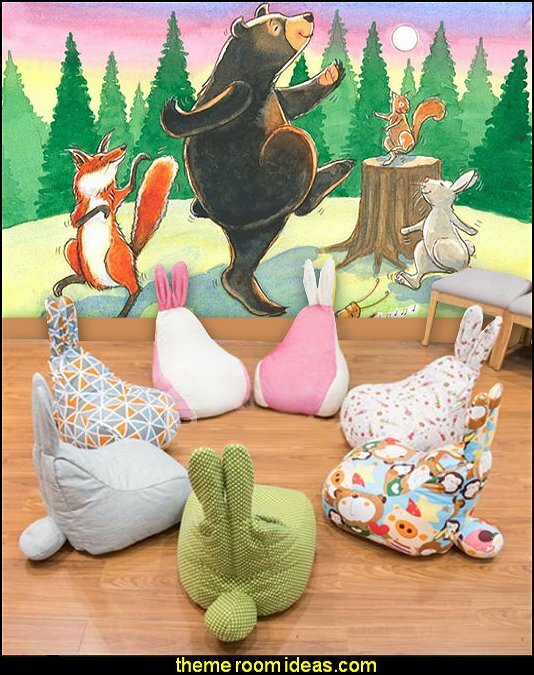 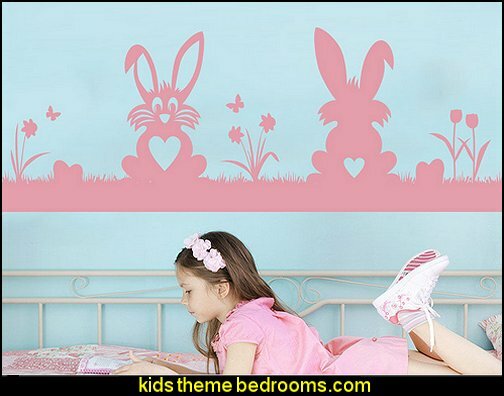 Based upon the main character in Beatrix Potter's classic "The Tale of Peter Rabbit"
Mrs. Rabbit and her children, Peter, Flopsy, Mopsy and Cotton-tail, are featured in this wall mural along with Benjamin Bunny, Squirrel Nutkin and a fine fat mole. 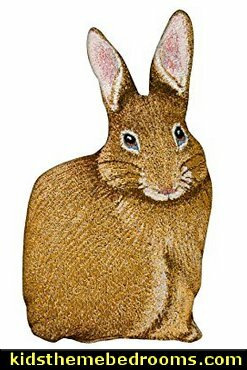 Meanwhile, Little Black Rabbit emerges from his burrow with a basket of carrots and Mr. Tod, the fox, goes for a stroll. 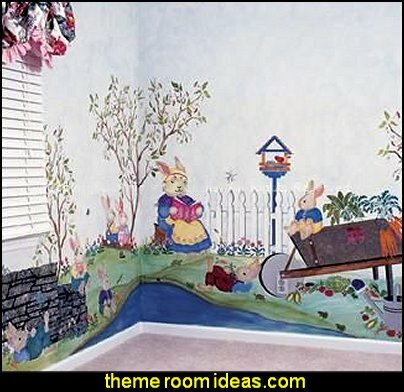 Bunnies and birds populate a charming country landscape mural by Beatrix Potter. 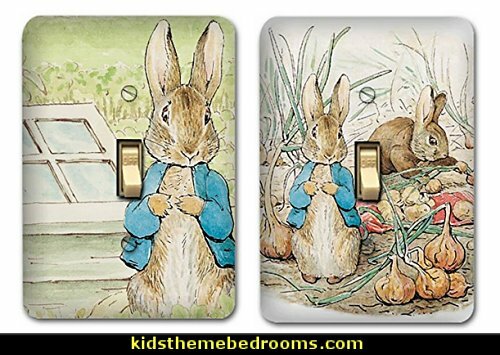 While Peter Rabbit munches on carrots stolen from Mr. McGregor's garden, Flopsy, Mopsy and Cottontail pick blackberries. 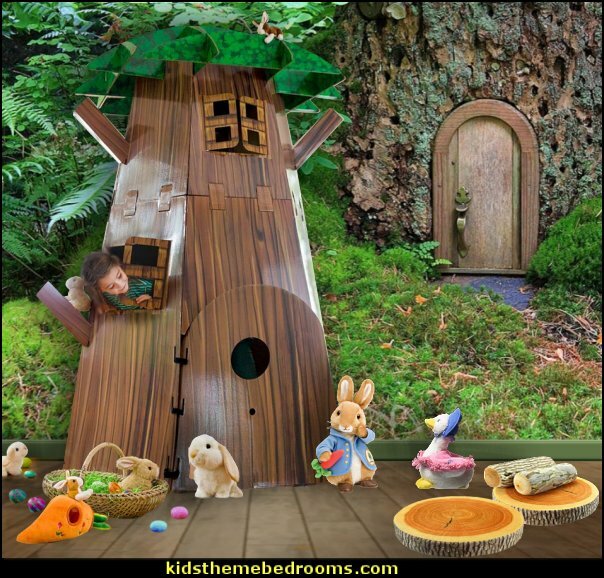 You'll also find a variety of other characters, from Squirrel Nutkin to Old Brown owl. 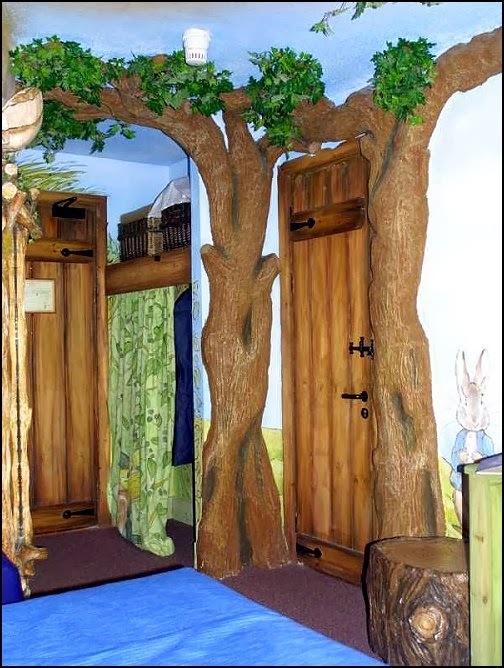 In a hollow of a large tree, a burrow home awaits the return of Mrs. Rabbit and her bunnies. 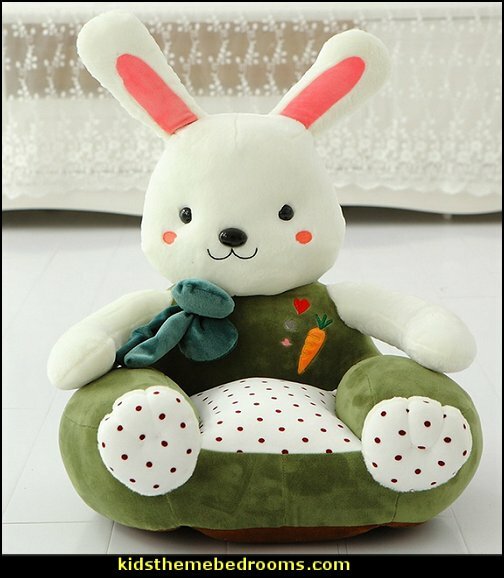 A cooking pot sits over a fire - perhaps Mrs. Rabbit is brewing some of her famous chamomile tea? 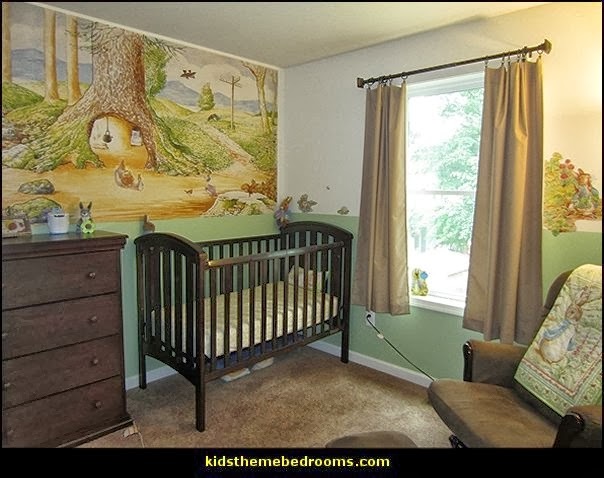 Near the burrow, blackberry bushes are ready for picking and a road sign points the way to other animal homes. 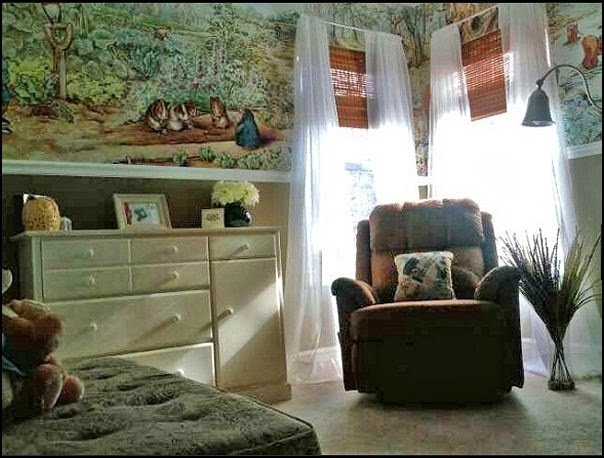 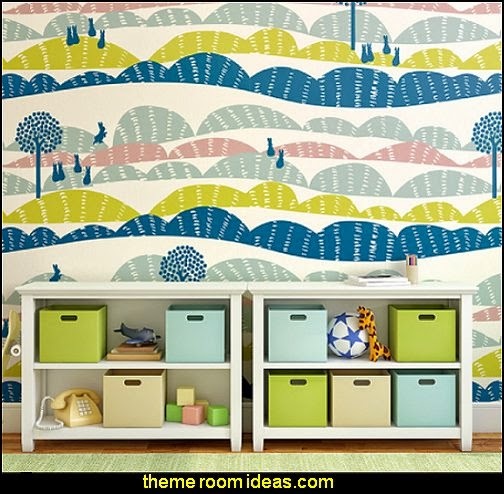 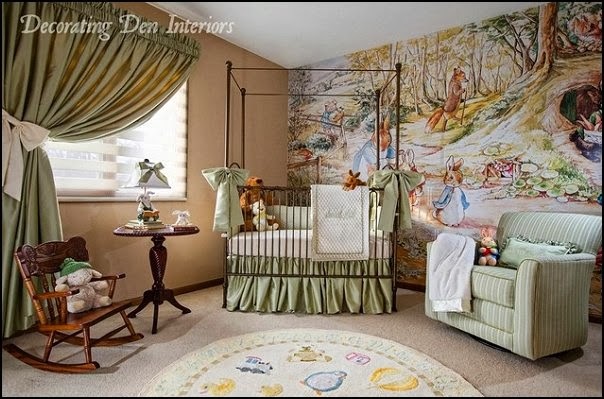 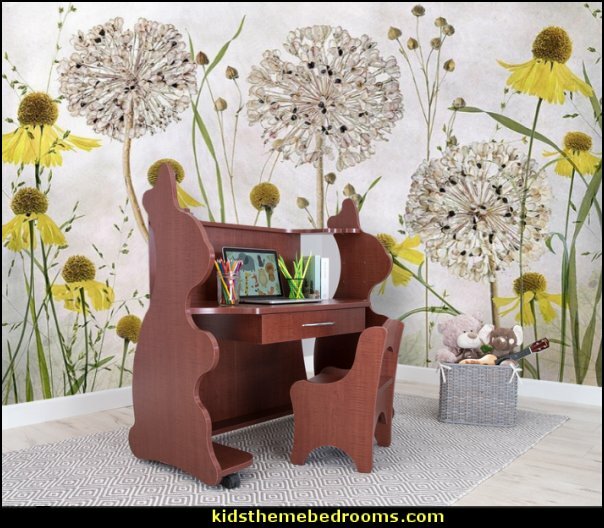 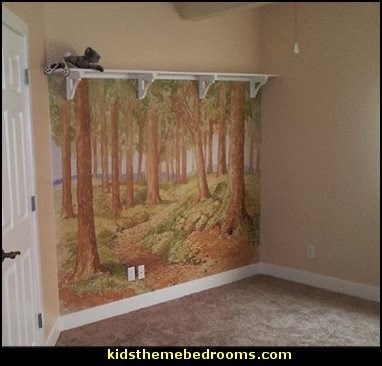 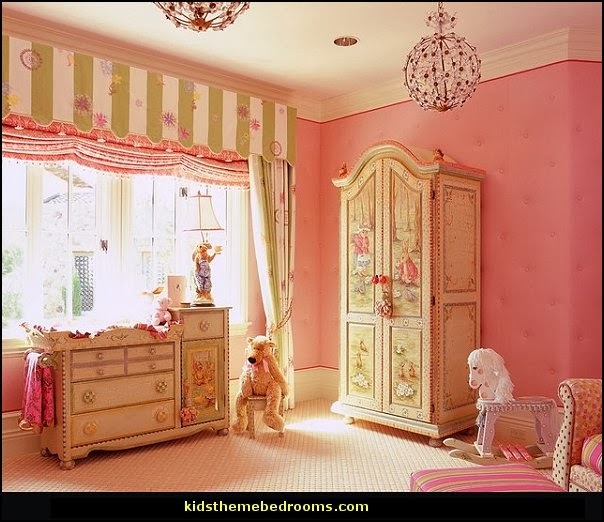 Get creative with your wall murals, frame them as large posters or cover the entire wall. 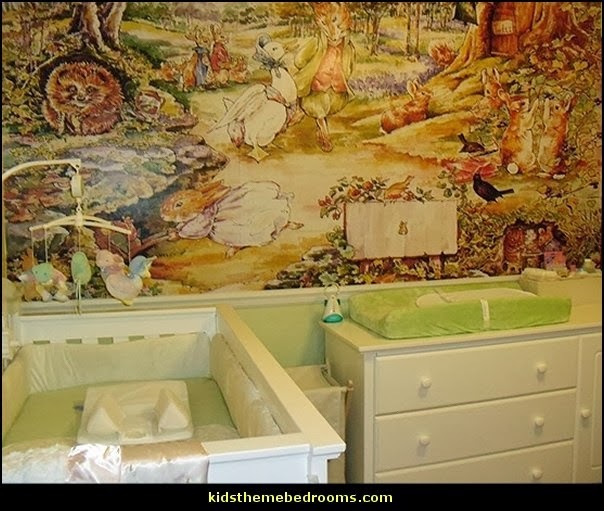 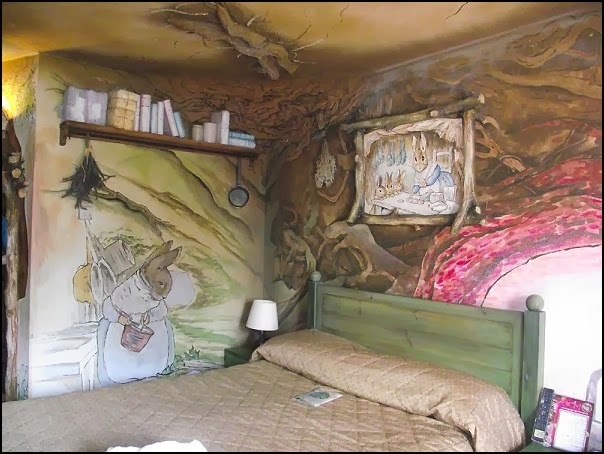 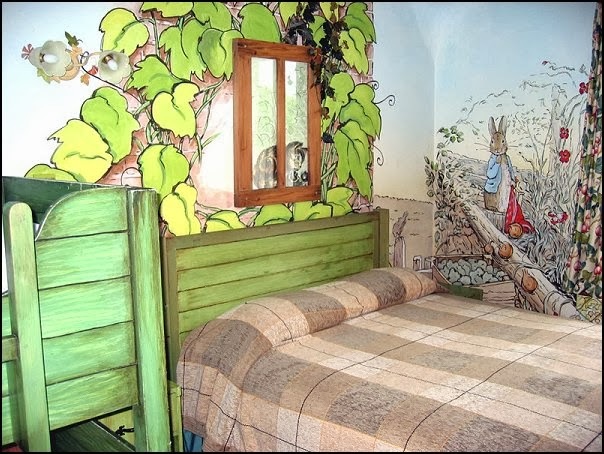 Jemima Puddle-Duck visits with Mr. Tod while strolling past the Pen Inn in this wall mural. Adorable Mrs. Tiggy-Winkle, lots of bunnies, the field mice and other characters populate this scene of the English countryside. 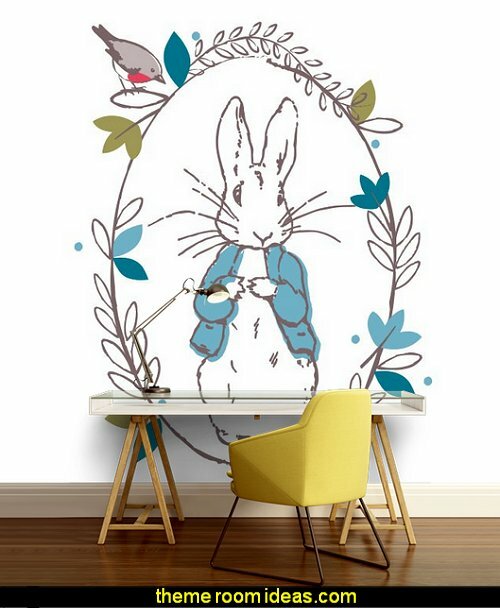 Ms. Potter, who is also known for her study of plants, decorates her illustrations with lovingly-drawn flowers, trees and moss. 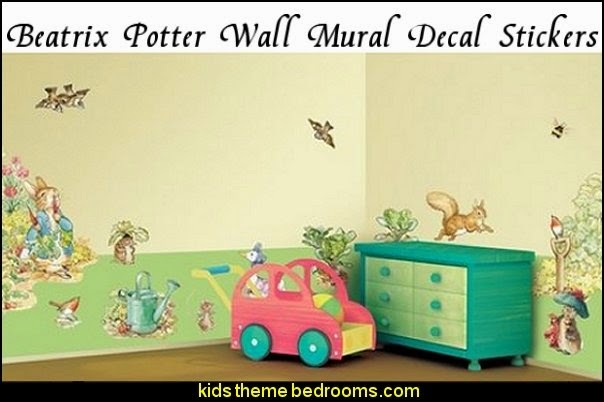 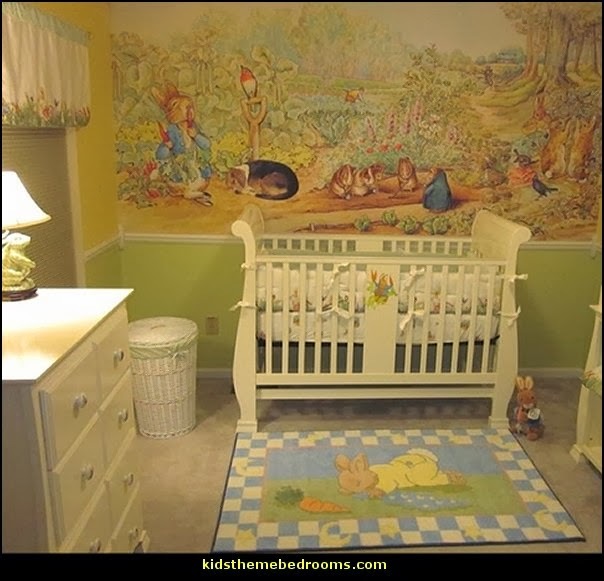 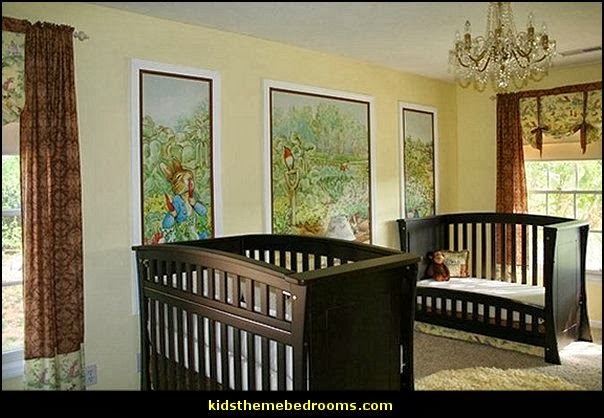 Personalize this mural by adding your baby's name and birthdate (or any message you choose) to the sign. 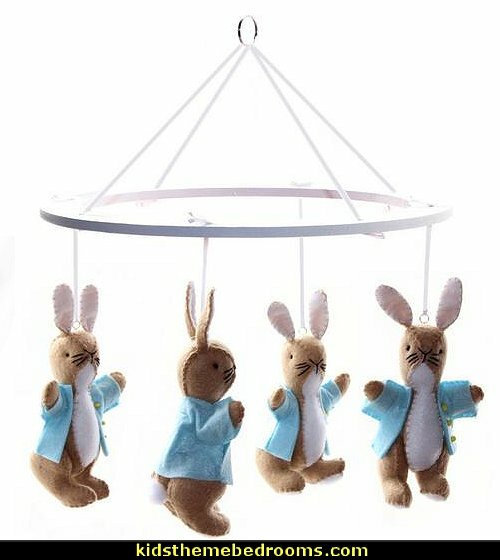 A beautiful Peter Rabbit mobile - perfect for any Beatrix Potter nursery, or that extra special baby shower gift! 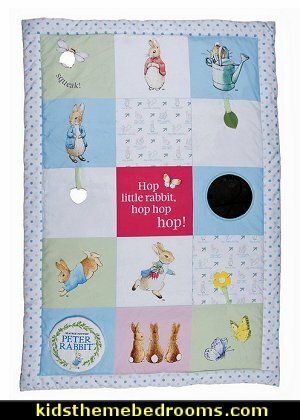 The crossbar is white and Peter Rabbit is brown, with white details and a blue jacket (complete with yellow buttons!). 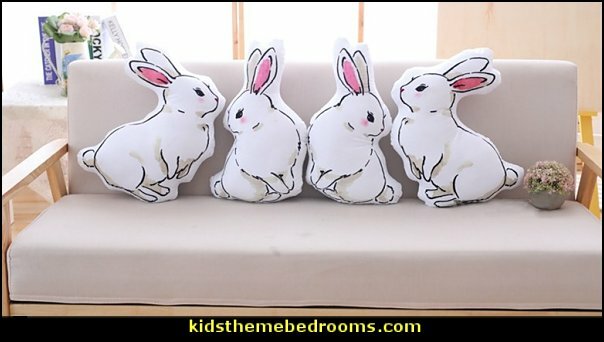 The little bunny tail is made from a soft white pom and all four Peter Rabbits are strung on the mobile using a white satin ribbon. 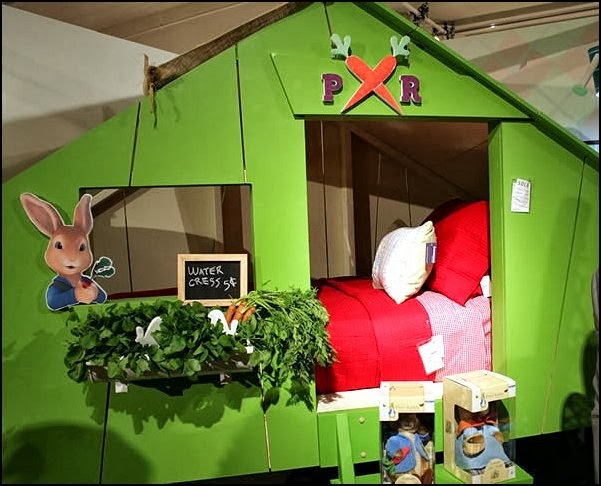 The figures on this mobile are made from felt and the crossbar is lightweight wood. 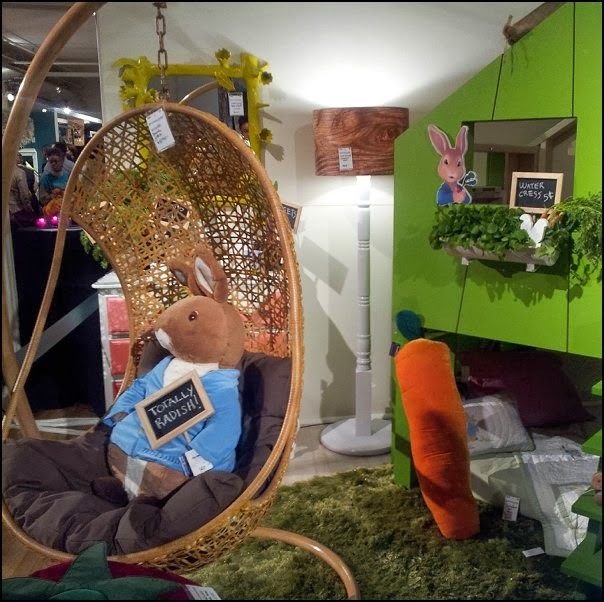 See the bunnies hop straight onto this enchanting bunny crib. 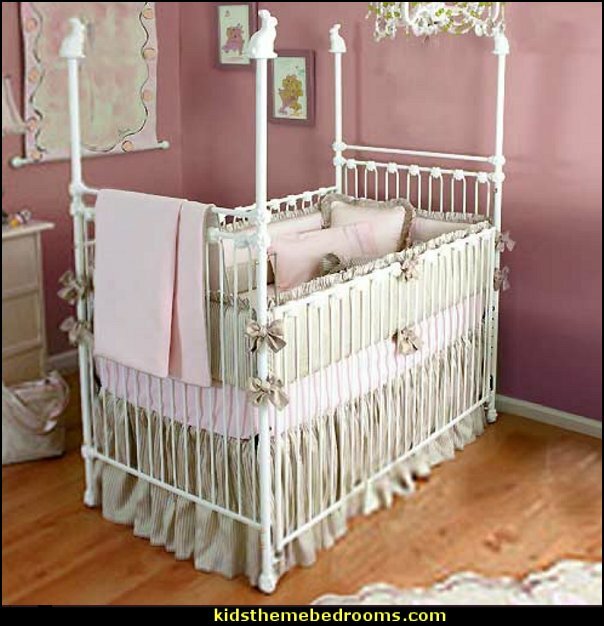 This storybook crib is hand forged from wrought iron and powder coated with a non toxic finish that resists pealing and scratches. 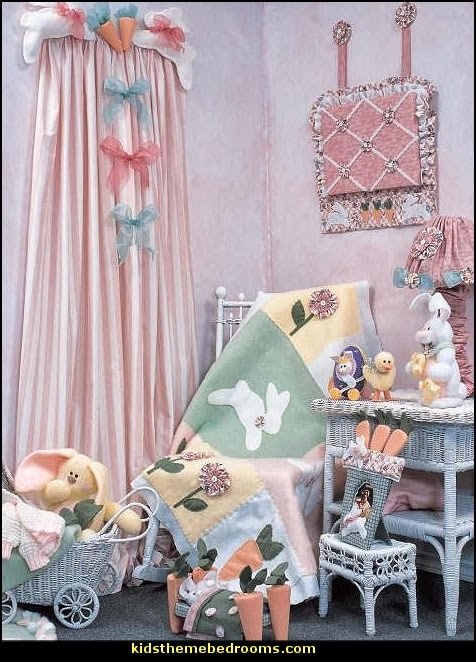 The bunny fairytale comes alive with scores of little rosette accents and cute little bunny finials that whisper good night to sweet little angels. 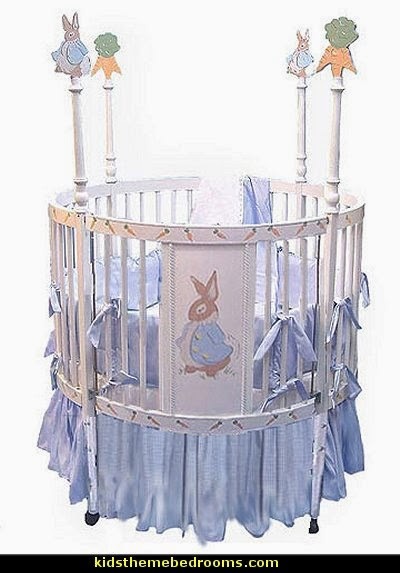 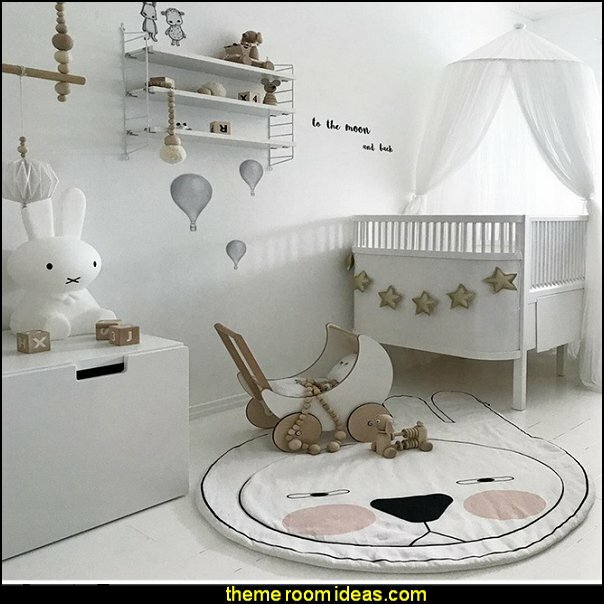 It’s definitely the most magical crib for your special little bunny. 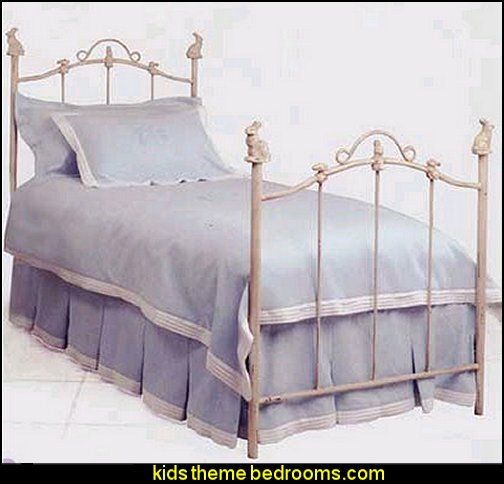 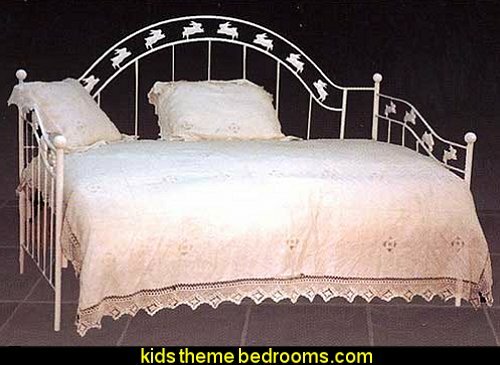 Iron Daybed with arched headboard and running bunnies or any other theme of your dream. 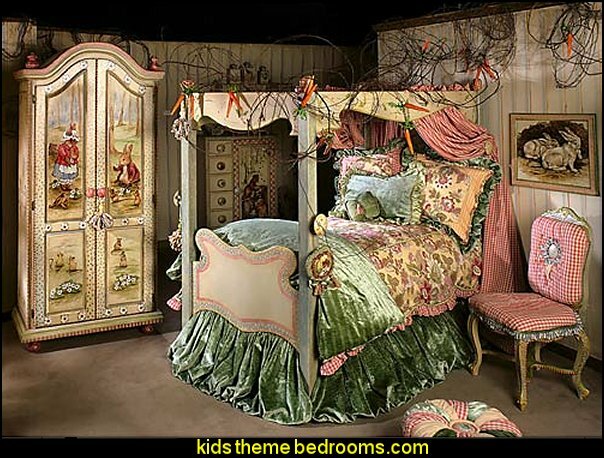 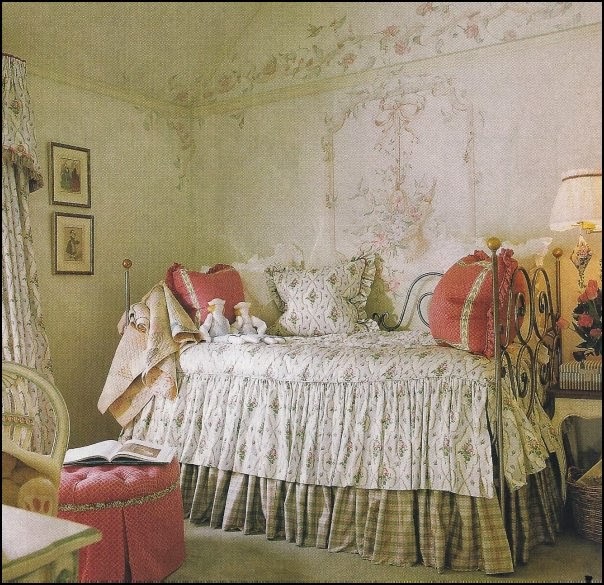 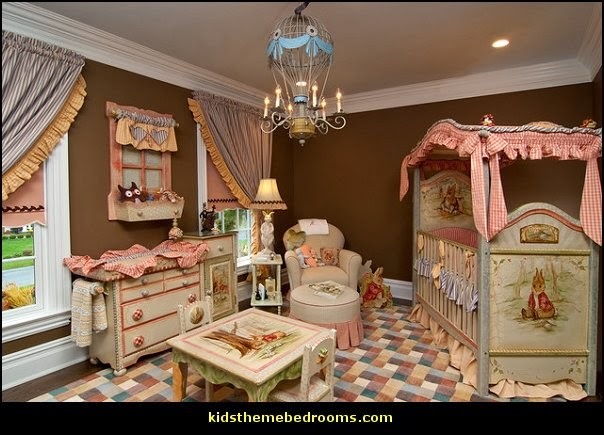 The bed has a vintage design with modern flair. 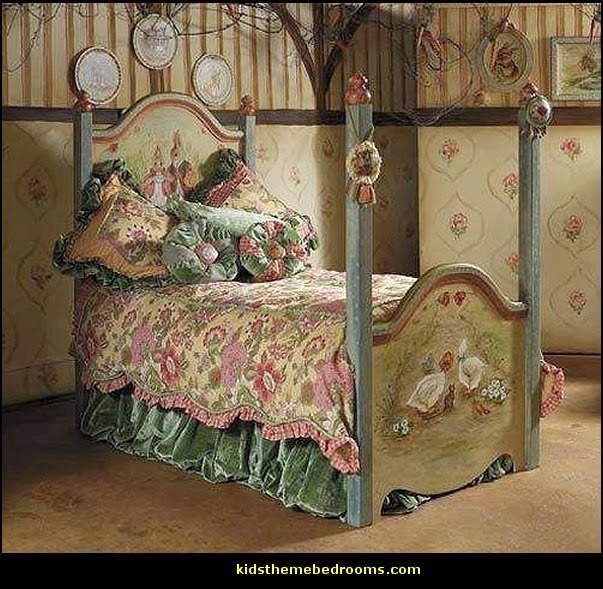 For more than 40 years Corsican Furniture has manufactured iron furniture and accessories with a commitment to quality and attention to detail. 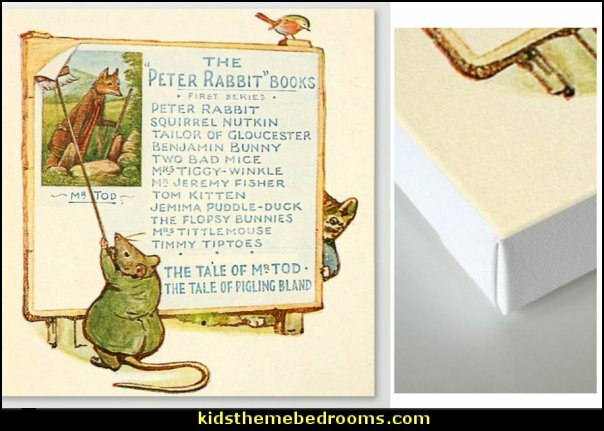 This illustration from Beatrix Potter features all the charm of her other artwork but without any of her animal characters. 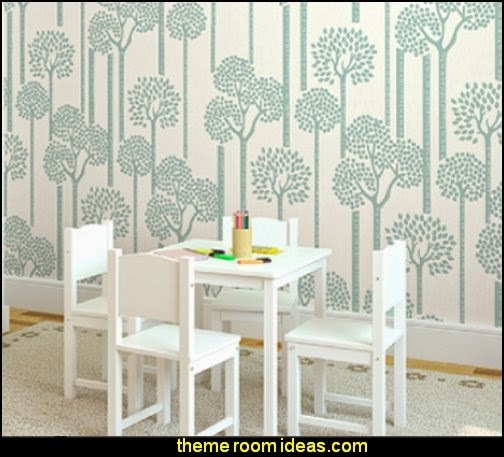 A footpath winds through trees and moss-covered rocks are scattered on the ground. 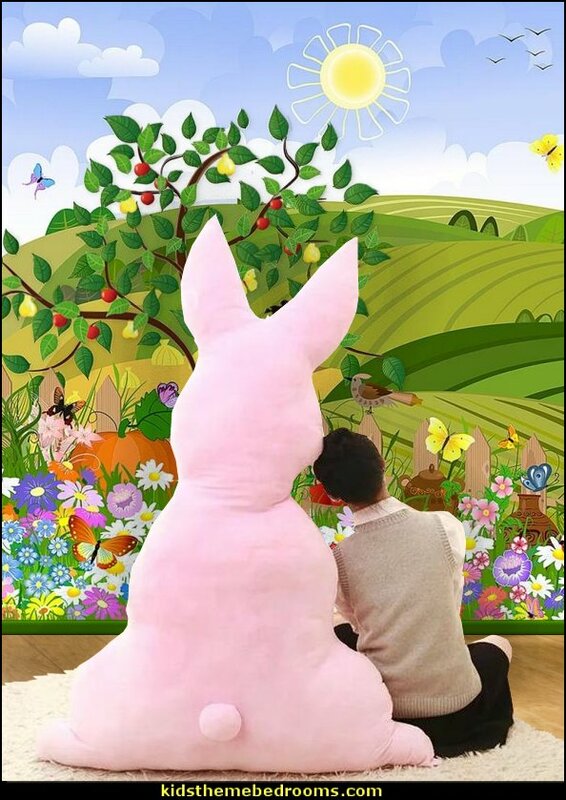 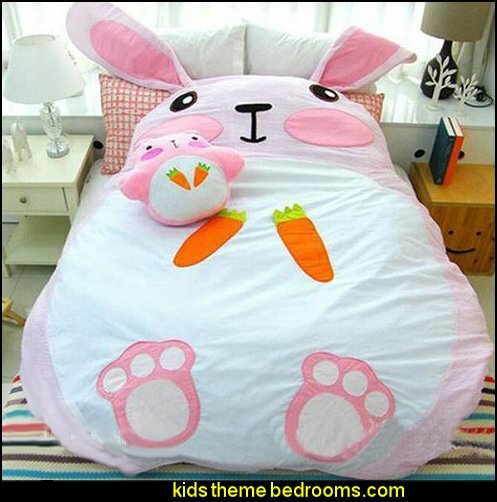 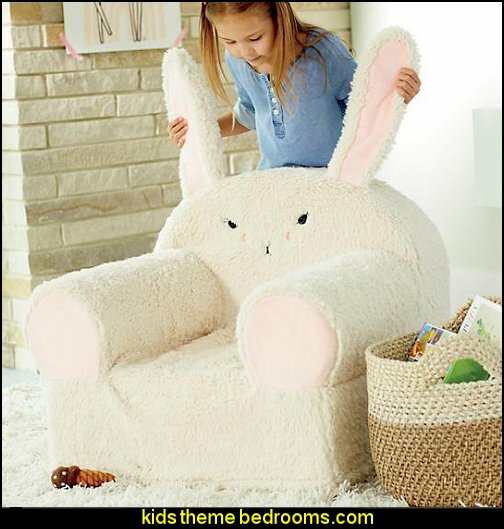 Cute soft and over sized sleeping bed in the fun shape of a cuddly bunny rabbit. 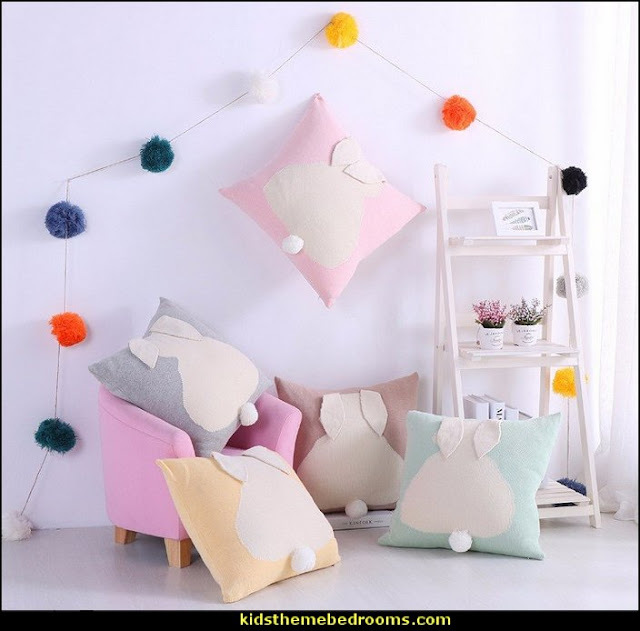 This collection is all about simple delicate colors, complementary patterns and adorable phrases that warm the heart. 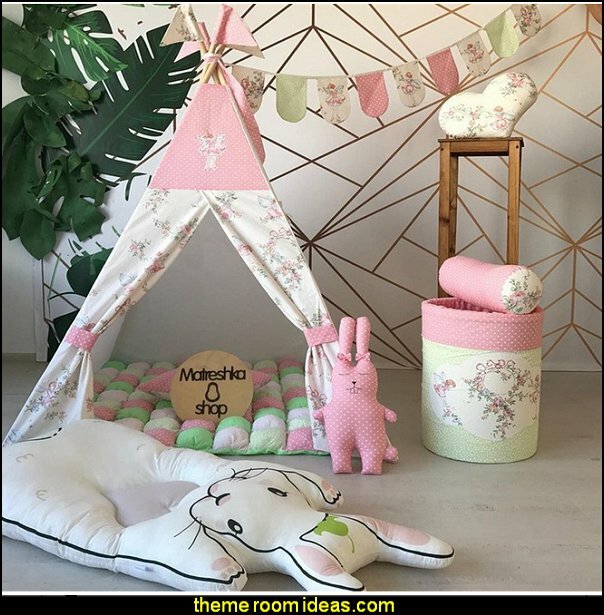 Yes—we said patterns! 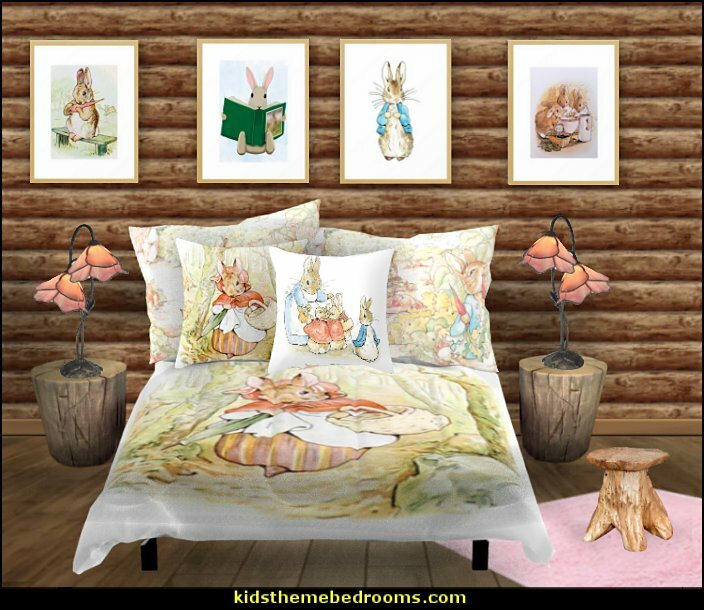 Beatrix Potter™ now has coordinating patterns so you can completely customize your Beatrix Potter™ room without it being covered in bunnies (not that there's anything wrong with that!). 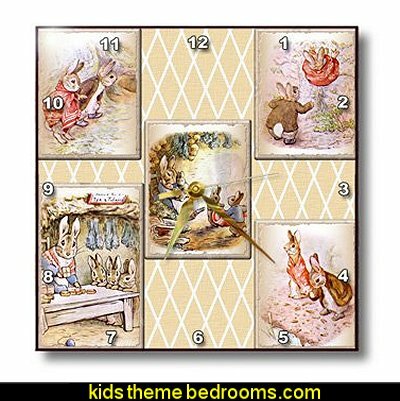 Peter Rabbit: First appearing 1902, Beatrix Potter's most popular character Peter Rabbit is best known for his mischievous adventure through Mr. McGregor's garden in The Tale of Peter Rabbit. 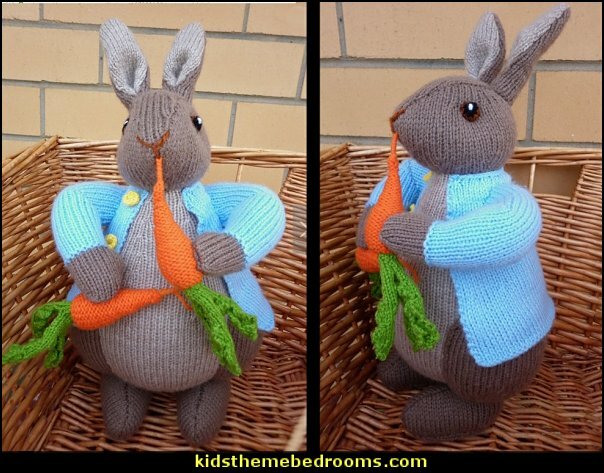 Peter Rabbit is an impulsive character with a taste for radishes and a thrist for adventure!